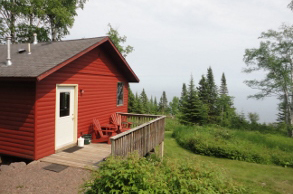 Our Cabins sit on a bluff right above Lake Superior. 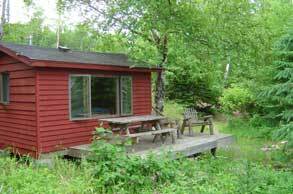 Most of our cabins are pine paneled inside with wood floors. 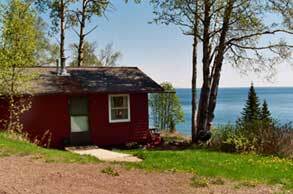 All cabins have full cooking facilities with propane stove/oven, refrigerator, toaster, coffee maker and ample dishes and cookware. Bathrooms include a shower, toilet and sink. 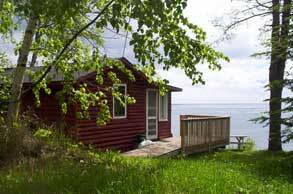 There is electricity, propane heat and the cabins are furnished simply but comfortably. 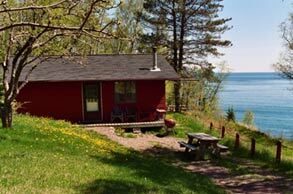 You won’t be bothered by a telephone or TV and there is NO WIFI. Come un-plug. Towels, sheets, and blankets are provided, along with hand soap, dish soap and toilet paper. We ask our guests to recycle and compost to cut down on garbage being dumped into landfills. We also have pure water from two wells that are each over 380 feet deep, State Health Dept. tested each season and tastes better than bottled water. We encourage you to leave your bottled water at home to cut down on our largest recycling item: plastic bottles. 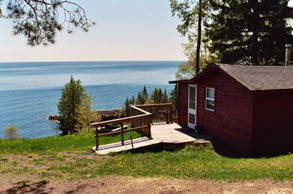 We are currently renting six cabins and taking week-long reservations. Click an image to see the cabin's layout. Prices shown are for 2 people. Add $10 for each extra person.